We’d love your help. Let us know what’s wrong with this preview of Gaston de Blondeville by Ann Radcliffe. To ask other readers questions about Gaston de Blondeville, please sign up. Gaston is Ann's attempt at a 'false document' Gothic, and is deliberately written in a fairytale-like cod-medieval style - which actually works, most of the time (as with any self-conscious narrative gimmick, it's hammered obnoxiously in the opening chapters and then mercifully dialled down as the actual story kicks in). Ann Radcliffe was an English author, a pioneer of the gothic novel. Radcliffe was born Ann Ward, her father, William, was a haberdasher, who moved the family to Bath to manage a china shop in 1772. Her mother was Ann Oates of Chesterfield. Radcliffe occasionally lived with her Uncle, Thomas Bentley, in Chelsea, who was in partnership with a fellow Unitarian, Josiah Wedgwood, maker of the famous Wed Ann Radcliffe was an English author, a pioneer of the gothic novel. Radcliffe was born Ann Ward, her father, William, was a haberdasher, who moved the family to Bath to manage a china shop in 1772. Her mother was Ann Oates of Chesterfield. Radcliffe occasionally lived with her Uncle, Thomas Bentley, in Chelsea, who was in partnership with a fellow Unitarian, Josiah Wedgwood, maker of the famous Wedgwood china. Sukey, Wedgwood's daughter, also stayed in Chelsea and is Radcliffe's only known childhood companion. Sukey later married Dr Robert Darwin and had a son, Charles Darwin. Although mixing in some distinguished circles, Radcliffe seems to have made little impression in this society and was described by Wedgwood as "Bentley's shy niece". In 1787, she married the Oxford graduate and journalist William Radcliffe, part-owner and editor of the English Chronicle. He often came home late, and to occupy her time she began to write, and read her work to him when he returned. Theirs was a childless, but seemingly happy marriage. Radcliffe called him her "nearest relative and friend". The money she earned from her novels later allowed them to travel together, along with their dog, Chance. She published The Castles of Athlin and Dunbayne in 1789. It set the tone for the majority of her work, which tended to involve innocent, but heroic young women who find themselves in gloomy, mysterious castles ruled by even more mysterious barons with dark pasts. Her works were extremely popular among the upper class and the growing middle class, especially among young women. Her works included A Sicilian Romance (1790), The Romance of the Forest (1791), The Mysteries of Udolpho (1794), and The Italian (1796). She published a travelogue, A Journey Through Holland and the Western Frontier of Germany in 1795. 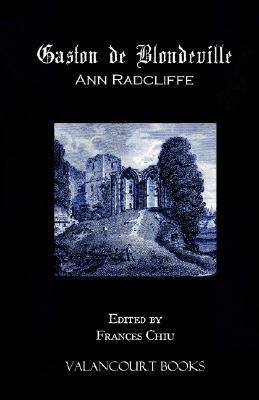 The success of The Romance of the Forest established Radcliffe as the leading exponent of the historical Gothic romance. Her later novels met with even greater attention, and produced many imitators, and famously, Jane Austen's burlesque of The Mysteries of Udolpho in Northanger Abbey, as well as influencing the works of Sir Walter Scott. Stylistically, Radcliffe was noted for her vivid descriptions of exotic and sinister locales, though in reality the author had rarely or never visited the actual locations. Shy by nature, she did not encourage her fame and abandoned literature as a pursuit. She died on February 7, 1823 from respiratory problems probably caused by pneumonia. She was buried in Saint George's Church, Hanover Square in London.